Step out of the city life by going to Nuuksio National Park and Vepsa Island. Your inner history buff will appreciate Old Rauma and Turku Cathedral. You'll find plenty of places to visit near Turku: Aurlahti Beach (in Lohja), Raseborg (Ekenas Old Town, Raseborg Castle, & more) and Hanko (Bellevue Beach, Hanko Water Tower, & more). 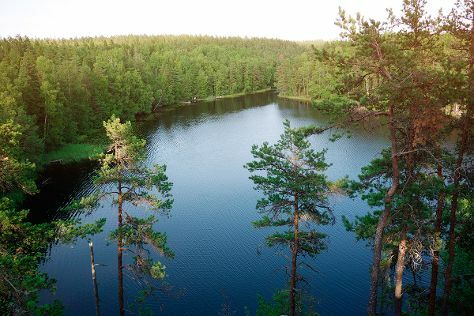 Spend the 5th (Mon) exploring nature at Teijo national park. There's much more to do: take an in-depth tour of Turku Castle, browse the different shops at Turun Kauppahalli, stay fit while traveling at Ispoinen Beach and Sauna, and delve into the distant past at Aboa Vetus & Ars Nova. To find maps, photos, and tourist information, go to the Turku online road trip planner . If you are flying in from Luxembourg, the closest major airport is Turku Airport. In July, daytime highs in Turku are 24°C, while nighttime lows are 13°C. Finish your sightseeing early on the 10th (Sat) to allow enough time to travel back home.